Little visitors get a big surprise at Shorelands, Bude! The Bovis Homes team at Shorelands were happy to help out when some budding Bude builders dropped in to their sales office to find out more about how homes are constructed and sold. 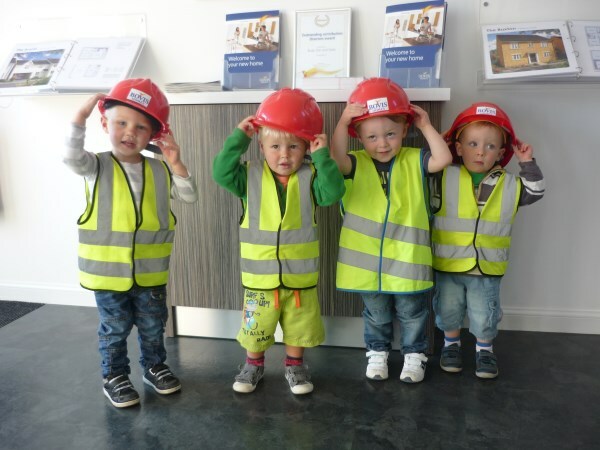 The group of 2 year olds from nearby Budehaven Day Nursery met Pam Belverstone, Bovis Homes' Sales Advisor, who kitted them out in the proper protective equipment and talked them through how a new homes development works and the importance of health and safety. And little did the group know that they had a fantastic surprise in store as, on their tour around the development, they were able to see some big yellow diggers! "The children were a delight to show around and were fascinated to see a working new homes development," said Pam. "They asked some excellent questions - and when they saw the machinery in action it really made their day! "Working with the local community is an important part of the way we work and hopefully trips like this give the youngsters an understanding of the need for new homes and how their own community works and evolves." Sami Rickard from the nursery, said: "The children were all aware that there was some building going on at Shorlelands but to see it first hand and to meet the team there was a real treat for them. "The trip gave the children a real appreciation of what goes into building and selling a brand new home - and of course seeing the diggers in action was the highlight of the visit!"